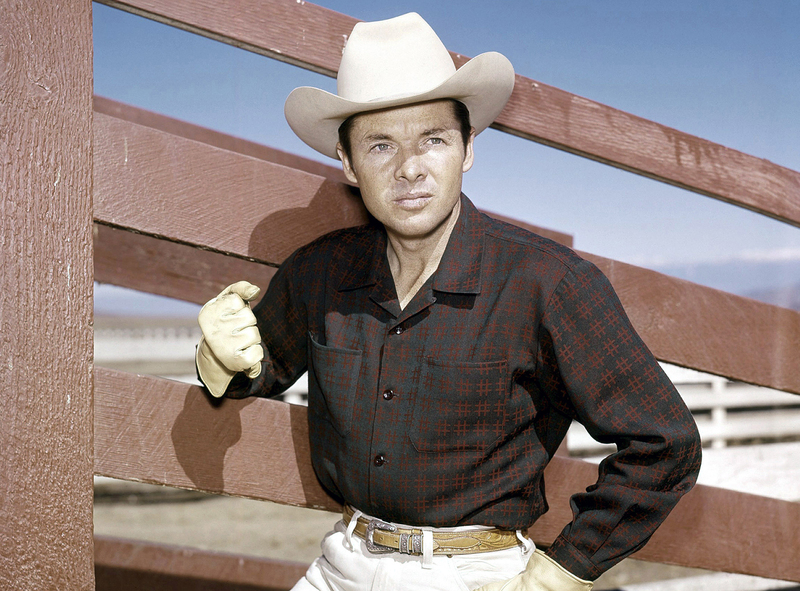 When he was just 17 years old, Audie Murphy altered his birth records so he could enlist in the military. The Texas native went on to become World War II’s most decorated soldier, receiving every award for valor available from the U.S. Army, as well as citations from France and Belgium. That alone would have made him one of the most significant Americans of the twentieth century. But Audie Murphy didn’t stop there. He became a charismatic film and television star with a thriving, two-decade career that was only halted by his untimely death at age 45. Today, Murphy is revered as both a war hero and a Western icon. And you can see why when getTV celebrates this great American with a night of his Western films and TV shows on Saturday, August 25 beginning at 8 pm ET. Audie Leon Murphy was born on June 20, 1925 to sharecroppers in the northeast Texas town of Kingston. When his father deserted the family in 1937, Audie dropped out of fifth grade and began picking cotton to support his eleven brothers and sisters. The attack on Pearl Harbor inspired him to serve our country in the armed forces; in three years as a combat soldier, Murphy fought in nine major campaigns, was wounded three times, and earned 33 awards and decorations. When he left active service in September of 1945, he became an instant celebrity. Murphy was “discovered” by actor James Cagney and his brother Bill, a producer. The Cagneys saw the handsome young hero on the cover of Life magazine in July of 1945 and put him under contract, bringing him to Hollywood for training in acting and diction. Murphy made his film debut with a small role in the United Artists comedy Texas, Brooklyn And Heaven in 1948 and scored his first lead role as a troubled teen in Bad Boy in 1949. He also co-wrote To Hell And Back, a best-selling memoir which was made into a feature film in 1955 — with Murphy in the lead role. “[It’s] the first time a man has fought an honest war, then come back and played himself doing it,” he said later. Murphy’s upbringing in the rural southwest made him uniquely qualified for a career in Western films. And his skills as a horseman are on full display in The Texican (1966), which kicks off our night of special programming on August 25 at 8 pm ET. Jess Carlin (Murphy) is a former Texas sheriff, now living in Mexico, who returns to the U.S. when his newspaper editor brother is killed. Broderick Crawford, an Oscar winner for All The King’s Men (1949), plays the man who shot him in cold blood. Needless to say, one of them doesn’t make it to the end of the movie. Filmed in Spain by prolific American director Lesley Selander, The Texican would today be categorized as a “Spaghetti Western” (or “Paella Western”). It’s fascinating to see the still-youthful Murphy in the rougher variation of the genre that was in vogue in the mid-1960s. (He even cusses in the film and lives in sin with his girlfriend!) The Texican has all the hallmarks of European Westerns: a gloriously hyperbolic score (by Nico Fidenco), Spanish actors dubbed into English (some better than others), and a gritty setting and story (although it lacks the sadistic violence of Sergio Leone’s Dollars films, which Murphy reportedly turned down). With his effortless charm and matinee idol looks, Murphy could surely have found his next chapter in European Westerns and action films. Sadly, he would make only two more movies. Made nine years earlier at the height of Murphy’s box office bankability, The Guns Of Fort Petticoat (1957) — airing August 25 at 10:05 pm ET — is a traditional Western filmed in beautiful Technicolor. Murphy (who also co-produced with Harry Joe Brown) again plays a Texan, a Union soldier who goes rogue to train and command a battalion of women homesteaders fighting off an attack by the Cheyenne. Twenty-three-year-old Kathryn Grant (who would marry Bing Crosby six months later) co-stars, along with a hilarious Hope Emerson as Murphy’s tough-talking, gun-toting second-in-command. Directed by George Marshall (who co-directed How The West Was Won with John Ford and Henry Hathaway), Petticoat is the rare classic Western filled with female heroes. Ray Teal, James Griffith, and Nestor Paiva provide able support as thieves who learn that women soldiers are no pushovers, especially when Audie Murphy is their commanding officer! To close the night we’ve got Whispering Smith, Murphy’s first and only TV series. He once described this inventive 1961 Western procedural as “Dragnet on horseback.” it’s an apt analogy, considering that Murphy narrates many of the episodes in the style of Jack Webb’s Joe Friday. Murphy plays a cop in post-Civil War Denver, assisted by Guy Mitchell as his good-natured partner George Romack and Sam Buffington as their always-exasperated boss John Richards. Fair warning: Whispering Smith is addictive, especially if you like your cowboy stories with a dash of noir. And we’ve got nine episodes to feed your fix, featuring guest stars like James Best, Bernie Kopell, Marie Windsor, and Alan Mobray. Audie Murphy died on Memorial Day weekend of 1971 when the twin-engine plane in which he was a passenger crashed into a mountain near Roanoke, Virginia. He was buried in Arlington National Cemetery on June 7, 1971. His final resting place remains one of the cemetery’s most-visited gravesites, second only to that of John F. Kennedy. getTV celebrates Audie Murphy on Saturday, August 25 with The Texican (1966) at 8 pm ET followed by The Guns Of Fort Petticoat (1957) at 10:05 pm ET. Then stay up late for an overnight binge of nine episodes of Whispering Smith starting at 12 am ET. Additional episodes of Whispering Smith air Monday-Friday at 6 am ET. For more, visit the getTV schedule.